Joel Ortiz is a Concept Engineer at Transmisiones y Equipos Mecánicos S.A. de C.V. (TREMEC) in Querétaro, Mexico. 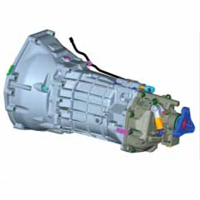 TREMEC is a leading producer of rear wheel drive light duty manual transmissions. Ortiz and other TREMEC engineers are responsible for ensuring that the performance of TREMEC transmissions matches up to demanding customer expectations. In the past, the only method available to resolve performance issues in prototypes was to go through the time-consuming and expensive process of making modifications to the prototype and hoping for the best. In testing an early prototype of a six-speed manual transmission, jumps were seen in the force applied to the shifter lever and felt by the driver of the vehicle. These jumps in shifting effort, called nibble by transmission manufacturers, do not affect the performance or durability of the transmission, but they are important because the reaction force against the gear shift helps define the shift quality of the transmission for the driver. Ortiz created a virtual prototype of synchronization mechanism in Adams with 17 parts including the shift rail, fork, roller detent, gear synchronizer cone, inner synchronizer ring, blocker ring, strut, sleeve, intermediate ring, clutches and gears. The geometries of these parts were based on the measurements of the prototype transmission. Ortiz used a virtual prototype to reduce nibble by 93% from the early prototype to the production model, contributing to rave reviews from automotive journalists.